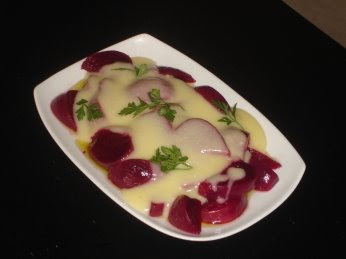 Greek Garlic Sauce - Skordalia - is a delicious accompaniment for a variety of dishes, but here we have it with beetroot. It can also be served on top of green beans and potatoes - adding olive oil to the vegetables before you pour the sauce on top, and is an excellent accompaniment, with the vegetables, for fried squid or any other fried seafood. And, by the way, don't worry - you and your breath don't smell of garlic after you've eaten it! Try it - it's really tasty. The food on the plate you see in the photo didn't last long after I had taken the photo! Put the beetroots in a pan of water that has already been brought to the boil and continue boiling until they are tender. Remove the beetroots, rinse them under cold water and discard the skin. Cut them into chunky pieces, place them on a dish and pour 2 tablespoons of olive oil on top. When they are boiled, remove them but do not throw away the water (see Ingredients above). Remove the skin from the garlic cloves and wash them. Put them in a food processor along with the potatoes and the other ingredients and make a thick sauce. If the sauce is too thick, just add some more water from the boiled potatoes. Serve the sauce on top of the beetroot. That sounds good. I just recently cooked my first fresh beet. I had only ever had them canned but since they are so easy and yummy I don't need to buy them canned anymore. I will definitely be trying them with this sauce. Thanks. Great blog! Hi! your Beetroot with Garlic Sauce recipe sounds so good! I've tried it and it's really tasty. My husband loved it so much that he beg me to make another one for dinner. He paired it with fried squid and crispy shrimps. Thank you so much for the recipe! I will definitely check your blog regularly. Thanks for sharing your yummy recipes, I can't wait to try them out.